I use various cameras for cinema, ENG, documentaries or whatever. One thing remains constant though, I always use my Anton Bauer batteries in favor of proprietary batteries that only work with one camera. My previous method of mounting my Anton Bauer batteries was pretty dismal, so I modeled up this quickly and printed it out. The design worked perfectly and I'm pretty happy with it. Also keep in mind that this entire thing could be designed and printed as a single piece. Since I had the Aluminum rail block already, my design used that. It's very strong. I modeled this in Blender 3D. I'm not much of a CAD designer and I only really know how to use Blender. I sliced the STL model in ReplicatorG and printed at 55mm/s with a layer height of .27. There's no extra support needed for anything and to clean up when you're done, just knock out the support posts where the battery bracket mounts. Attach the printed bracket to the microClamp with a 1/4"-20 Panhead screw, I think mine is 3/4 long. Maybe you could use 1" as the longest possible. 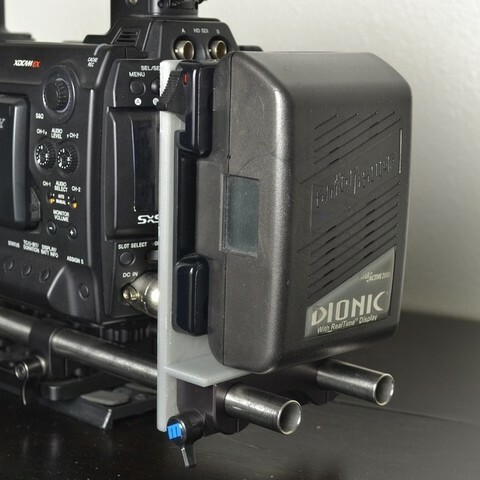 Remove the back from your Anton Bauer battery mount. 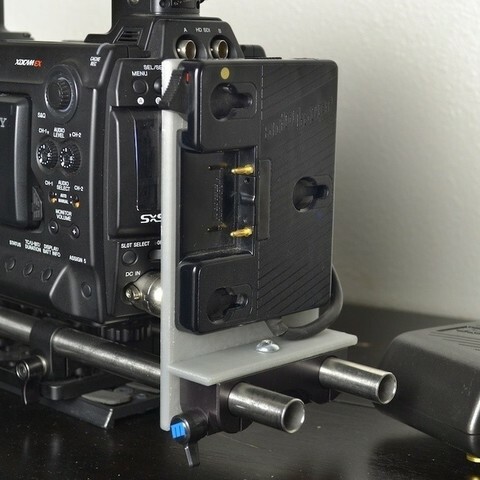 Repurpose the screws to mount the Anton Bauer part to the printed bracket. For me, the Anton Bauer screws were just a tad short. I had a bag of screws from Allied Electronics that fit better. Sorry, I don't know the thread or part number for the screws I used.